Seconds before impact, Emma Rothbrust cheered on the Grandview police officer — in hot pursuit far from his home turf — as he blew through a red light in Leawood. “Go get him,” said Rothbrust, 16, as she and a friend waited for him to clear the intersection. As soon as they pulled out, a second Grandview cruiser, traveling 81 mph, slammed into the passenger side of the car where Rothbrust was sitting. The 2004 crash left Rothbrust with serious injuries and the city of Grandview on the hook for a $2.9 million settlement with Rothbrust’s family. After an investigation of the pursuit, the Independence Police Department said officers did not violate its policy. Cooper’s lawyers disagree. 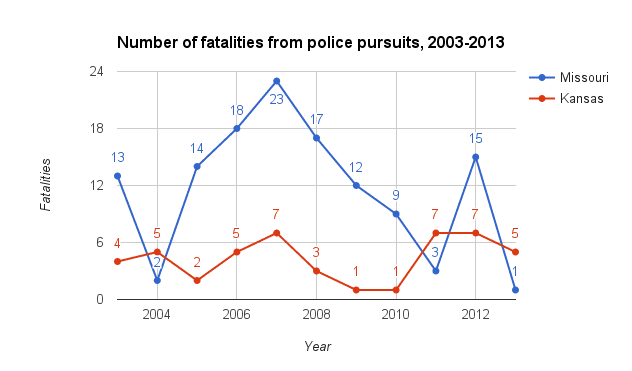 During the decade from 2003 to 2013, nearly 4,000 people reportedly died in police pursuits across the country. That includes 127 deaths in Missouri and 47 in Kansas. The Kansas Highway Patrol also refused to release any portion of its pursuit policy, claiming in part that to do so would “jeopardize the security of the … agency.” Overland Park cited the same exemption for heavily redacting its policy. “Given the fact that many police pursuits result in injuries or property damage, the police should only pursue violent felons,” said Jonathan Farris, chairman emeritus at PursuitSafety.org, a nonprofit that advocates for safer pursuits. Farris’s son Paul was killed in 2007 when a driver being pursued by a state trooper over a traffic infraction plowed into the Boston taxi he was riding in. Holding officers and departments responsible when innocent bystanders are injured or killed can be challenging, said Farris, whose son was killed in the accident in Boston. “The state trooper involved in my son’s case is still on the job, even though he pursued the driver into the suburb of Somerville, which has a no-chase policy in such cases,” Farris said. This investigative report by Mike McGraw and Bridgit Bowden was produced in collaboration with The Kansas City Star and KCUR. 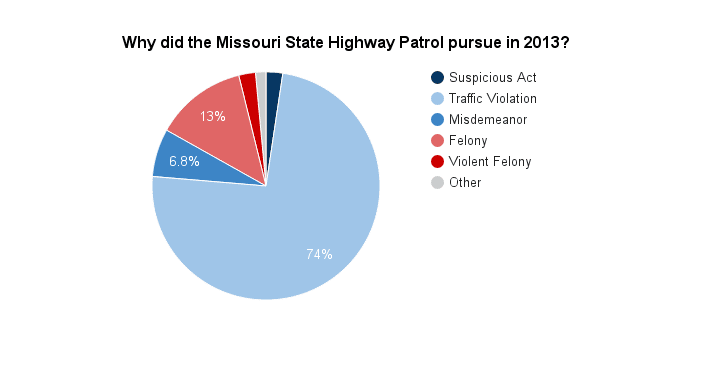 See also this story on why bystanders injured in Missouri police pursuits face uphill battles in court.